Right, that's it, I quit! The first has to be based on an easy recipe from a previous post, but adjusted because of some seasonal foraging. Here Tom is where we might differ, as you know, I love to pick form the hedgerows to cook, but you always seem to have that doubtful expression that many have. If my children like it, it can't be that bad can it? Really? Picking things from the wild is less about saving the planet and hugging trees and more about free food, how can you ignore free food!! I used some of this bunch in a wild garlic and butternut squash risotto, and then some in Wild Garlic and Parmesan scones, lovely, just lovely. 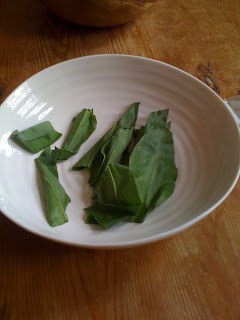 These were so tasty that I hope to go looking for more wild garlic thiis weekend just so that I can make some more. I hope you are ok, and managing to feed yourself properly! !